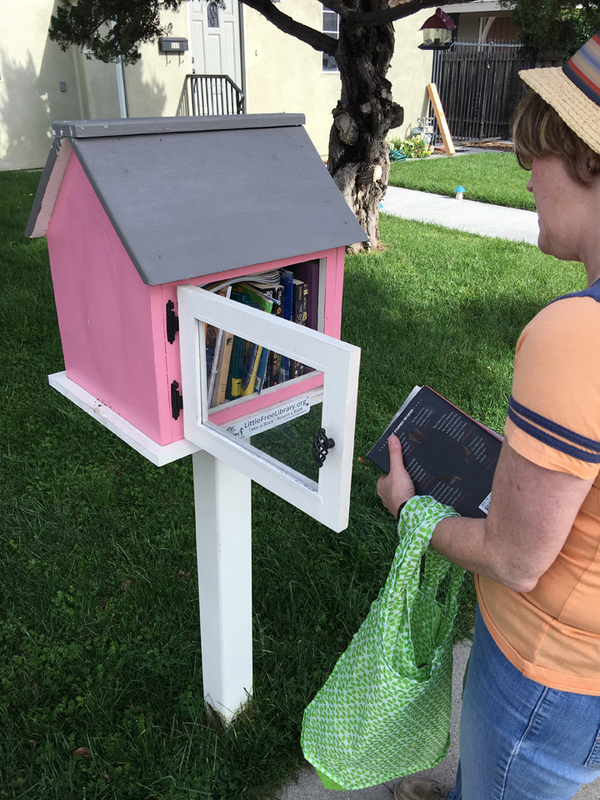 First things first: I want to give a shout out to the Little Free Libraries of the world. A few weeks ago I picked this up from one in my neighborhood and it was my first time borrowing anything from one of those tiny bibliotecas. I’d heard of this novel but might not have been prompted to borrow it if I hadn’t seen it through the friendly little window. I’m inspired to pay it forward by adding something from my “already read” stack when I return it. Second, I don’t normally read reviews before I write my own, because I want to be honest about what I’m feeling and I don’t want to inadvertently borrow someone else’s thoughts or jump on a bandwagon. But I’m struggling a bit with this one, mainly because I don’t normally read young adult literature. I can enjoy something from that genre, but I will rarely love it. My initial reaction to this novel is it has positive things to say and it’s an important story, but it’s not terribly subtle. 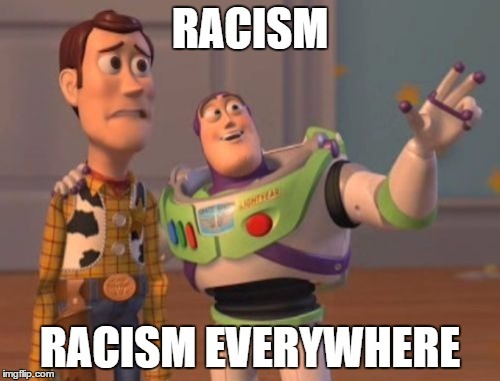 I’m the first to admit that I’ve become jaded from seeing the same story play out on the news on a weekly (daily?) basis. I don’t think it’s tremendously insightful to say that an unarmed man shouldn’t be pulled over and shot by the police for driving while black, and whether or not he was a drug dealer is an irrelevant discussion. This shouldn’t be a revolutionary idea. Then I read a review like one I saw recently on GoodReads, and I realize my naiveté stems from underestimating what counts as a revolutionary idea. 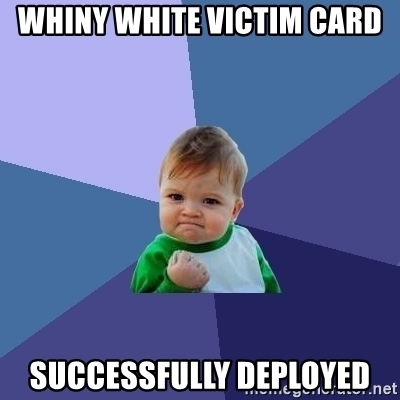 Then I tried to find a sarcastic meme about racism to go with this point and had to stab my eyes out with an American flag because of the sheer number of truly racist memes there are online. Then I went back and read The Hate You Give again and asked forgiveness for ever doubting its necessity. So I guess the reviewer’s point is that she/he doesn’t see color? And anyone who talks about race issues is racist? So after giving this book much thought, I decided I may not love it in terms of its style and execution, but it wasn’t written for me. It’s also not written for people who have decided either a) racism doesn’t exist or b) white men are persecuted just as much as anyone else. 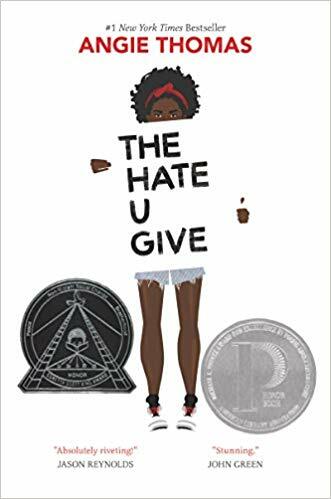 I’d love to see young adults of every race read this novel to help them develop empathy and understanding of another group’s challenges. But primarily, I think this was written for the 16-year-old black girl who doesn’t see herself and her issues represented often enough in main stream movies and television. Starr is a hero for the 21st century: brave (though she denies it repeatedly), strong, loyal. Of course this doesn’t stop parents complaining about the book and getting it banned in some school districts because of either the use of profanity, the references to drugs, or the perceived “anti-police” message. Don’t worry kids, if you can’t get this book at school, you can always check it out of a little free library! Here I am returning it! And paying it forward with Ready Player One. Good karma, here I come! 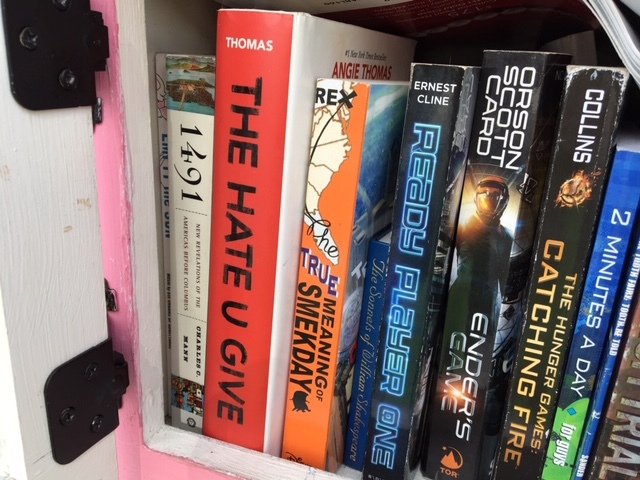 Filed Under: Fiction, Young Adult Tagged With: #blacklivesmatter, #CBR10, Angie Thomas, black author, KimMiE"
I love those Little Free Libraries! Interesting selection in there. Excellent review. I don’t usually read stuff that’s going to make me sad/mad (because I am a weenie), but I love reading all about books that are taking the world by storm, and this one especially has gotten a lot of CBR attention. This is a “love/hate” book by bringing up all the “feels” we have on the subject. Great review!